Do you have a FELIX 3.1 or older and do you want to benefit from the latest technology without the hassle of upgrading yourself? Let us do it for you! With the FELIX Upgrade Service your printer will be fully serviced, repaired if necessary and of course upgraded to the Tec 4. Upgrade Single to dual head? One of the greatest achievements in the Tec 4, is the integration of the semi-automatic software leveling and Bump-Map Registration. This new feature will guarantee a perfect first layer, which is essential for a successful print. With the automatic leveling, your printer will be up and running within minutes after turning it on. 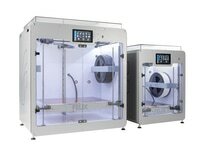 A major improvement of the Tec 4 is the integration of all metal print heads. The all new full metal hot-ends will be much more wear resistant, more reliable and are able to print all kinds of materials much easier. The completely new build platform brings more comfort when it comes to easily pre-leveling the printer and to removing printed objects due to the FELIX Flexplate. Simply bend the Flexplate and the object will pop off. 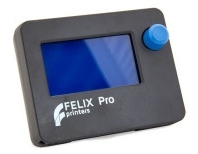 The FELIX Tec 4 comes including a large and bright LCD display. The menu structure has been redesigned from the very beginning to ensure a smooth as possible user experience. Besides the changed layout and the Flexplate, the Tec 4 build platform is 15% lighter compared to the FELIX 3.1 build platform. This creating a better balance between the printer frame and the build platform. Optimized airflow significantly improves the quality of your prints. Thanks to the improved cooling, we have noticed a huge improvement in output quality when printing with Water Soluble Material (PVA). Also the creation of bridges and overhangs are much easier to print with Tec 4 fan ducts. With the bright TEC 4 LED’s you can conveniently monitor your print job during printing. The object you are printing will be shining right in the spotlight.